Modern spun-circle design Asus X550CA-SI50304V is a 15.6 inch notebook with a powerful Ivy Bridge Intel i5 processor, 4 GB RAM memory and 500 GB hard drive, so these specs seem standard and this is not a high end top of the range computer but with its stylish design, efficient i5 processor with Turbo Boost function, DVD drive and other great connectivity options, it is ideal for students, home and office workers to run things smoothly on a day-to-day basis. The 64-bit Windows 8 OS can be upgraded to the latest 8.1 free of charge through the Microsoft store. Windows 8 provides a stable platform and the 8.1 comes with extra handy features even though it is criticized by those that prefer Windows 7, but some like it even more once they get used to it.15.6 inch high-definition non-touch anti-glare display with 1366 x 768 pixel resolution and Intel HD Graphics 4000 for clear images with vibrant colors in photos, videos and games. You can always connect it to your larger HDTV through the HDMI port and cable. Audio is clear, rich and loud with the dual stereo speakers, Sonic Master sound system and Asus AudioWizard technology. It comes with a 1.0MP HD webcam with a built-in microphone for great Skype chats with friends and family. In terms of connectivity, you have the Multiformat DVD±RW/CD-RW Drive to create custom DVDs and CDs, an HDMI port, a Digital Media Card Reader that supports Secure Digital format, a USB 3.0 port for transferring digital audio, video and data faster, a USB 2.0 port, High-speed wireless LAN (802.11n), Bluetooth 4.0 for connecting wirelessly to Bluetooth enabled devices, 10/100/1000 Mbps Fast Gigabit Ethernet LAN - with RJ-45 connector for quick and easy wired Web connection, Single combo audio jack, VGA port and a security lock slot. 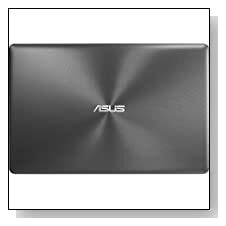 Gray attractive patterned design with small Asus logo- premium and expensive looking Asus X550CA laptop weighs just over 5 lbs and is 1.25 inch thin (9.9 x 15 x 1.2 inches)- so it is fairly light and portable. It comes with a full size island style keyboard with chiclet keys and a full numeric keypad on the right for comfortable typing experience. 4-cell lithium ion battery should give you around 4 hours of battery life in normal use- being an ENERGY STAR certified machine it is made to use less energy. IceCool Technology makes sure that the laptop stays cool on your lap or you don't feel the heat when you are working on it. 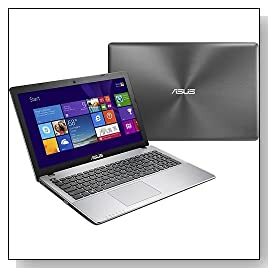 Conclusion: Gray metallic looking 15.6 inch Asus X550CA-SI50304V presents good value for money overall, with its powerful Intel i5 processor, adequate amounts of memory and hard drive, stylish design, durable build, DVD Drive, USB 3.0 port, Bluetooth 4.0 and other useful connectivity ports and Asus name that shows in quality of components and build at an affordable price. It would have been nice to have a touch screen to use with Windows 8 and perhaps the RAM or hard drive could be a little higher but you're also paying for the Asus quality components in a modern package that comes with decent features to use on a daily basis. Good value for dollar and worth checking out.